When we sat down to define our values as a foundation, inclusivity was top of mind. We see everything we create, from buildings to programs, as an opportunity to stay true to that value. A primary goal is that the Foundation and the Obama Presidential Center be standard-bearers for diversity, equity, and inclusion at all levels. This goal extends the definition of diversity beyond race and gender to include veterans, people with disabilities, and members of the LGBTQ community—and we’re looking to our neighbors in underrepresented communities to help us identify and engage these partners. So, how are we doing? A third of the Foundation’s leadership team identifies as a person of color, two-thirds are women, and among those we also have LGBTQ representation. Our board, chaired by Martin Nesbitt, is composed of long-time champions of equality including Thelma Golden, Dr. Mahalia Hines, John W. Rogers Jr., and Juan Salgado to name a few. For a complete list of our directors, refer to page 55. On the professional service front, in 2017, we spent over $6 million with more than 70 diverse businesses across sectors including legal, digital, insurance, and design among others. A quarter of that—$1.5 million—was with Chicago-based companies. Our responsibility is to increase that number steadily as we grow, so that diverse business owners across industries will have meaningful opportunities unlike ever before. Still, inclusivity is not about reaching a magic number or spending a certain dollar amount; it’s about changing attitudes and lives. For that reason, we began a program in 2017 focused on providing paid internship opportunities and workforce readiness training for low-income high school seniors. The Obama Youth Jobs Corps (OYJC), launched in partnership with Urban Alliance, a national youth development nonprofit organization, seeks to break down the stereotype that success is only for certain people. During the 2017 school year, we put 18 students to work at seven organizations, for more than 1,400 total work hours. 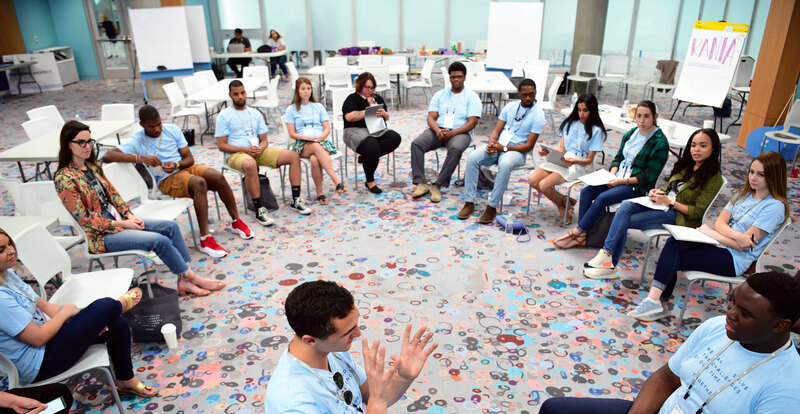 The OYJC team devised and taught a civic engagement curriculum to nearly 175 additional sophomores and juniors, many of whom will be placed in internships upon reaching their senior year. In the students’ words, the OYJC has afforded them an opportunity to see things they never thought they would see and help their community in a positive way. Our 19-person Inclusion Council was created to advise the Foundation on ways to transform opportunities for underrepresented groups. Composed of people who have dedicated their lives to socio-economic justice, the Council functions as an independent body that offers guidance to the Foundation and objective evaluation on issues of diversity, equity, and inclusion at every level. Large-scale institutional projects are often awarded to big-name majority-owned construction firms. We decided early on in the planning process that we would do things differently. Any firm participating in our request for proposal process would have to provide evidence of a serious and longstanding commitment to diverse representation at the decision-making table, as well as a belief in our shared values of community engagement, diversity, and inclusion. A promise in proposal form wasn’t enough. We wanted proof they could walk the walk. Around the same time we were putting together the contract, five construction firms were assembling to create one expert team. Four of the largest, most respected African-American-owned firms in Chicago—Powers & Sons Construction Company, UJAMAA Construction, Brown & Momen, and Safeway Construction Company—joined to form the Presidential Partners. These firms were thinking unconventionally as well: they interviewed a number of large national firms to find the ideal partner to share in their bid. That company was Turner Construction Company, one of the largest construction management firms in the United States. Together, Turner and the Presidential Partners formed the Lakeside Alliance. 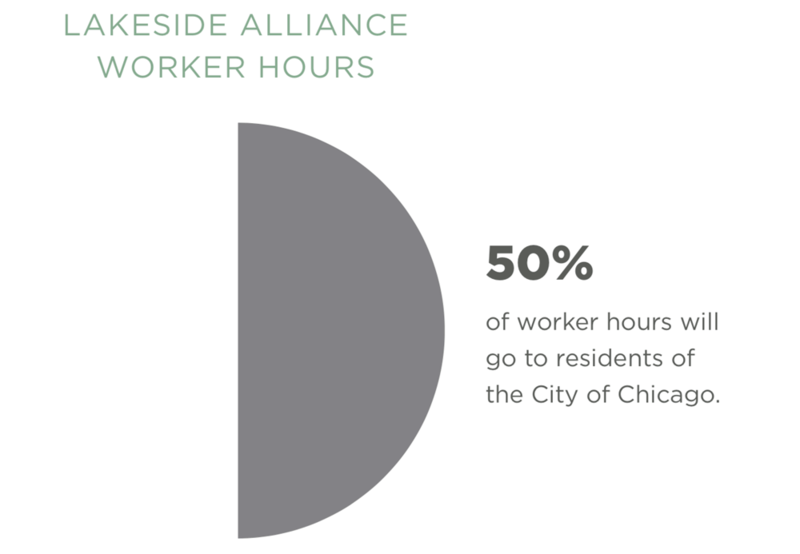 In Lakeside Alliance, we saw a willingness to do the hard work necessary to overcome obstacles that make it difficult to build diverse workforces. Lakeside has committed to building a pipeline of talent from underrepresented populations that are not only equipped to build the Obama Presidential Center, but are also prepared to participate in future projects across the city. Lakeside Alliance means we have four African-American-owned firms at the head table, all of them profiting from the project, gaining experience that will allow them to compete for similarly sized projects in the future, and offering their expertise to help shape the Obama Presidential Center so that it reflects the diverse community we share. 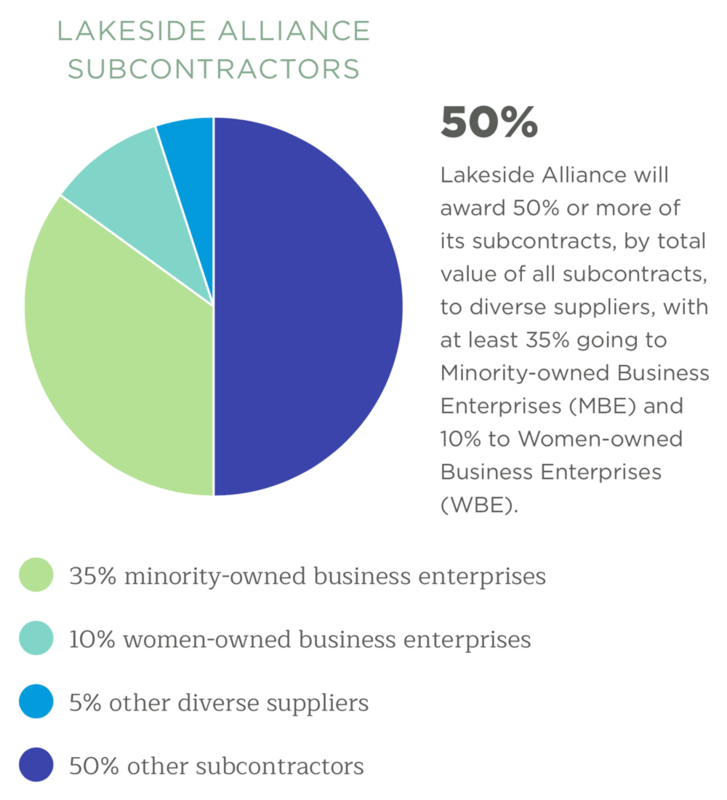 In its contract with the Obama Foundation, Lakeside Alliance has committed to meeting an ambitious set of diversity and inclusion goals, with financial incentives for exceeding those goals and penalties if they fail to meet them.